Collected Traditional Style kitchen with Curly maple countertops, soapstone sink, hidden appliances,and aged primitive painted finish. Is this door only available in wood? I am not sure I did the kitchen only. Door trim - What is the layout for the door trim, is it 1x material stacked? What paint color and texture (flat, sheen) is the door. Lovely! I love the light. Is it copper? Can you tell me the manufacturer and where you found it? Thanks! An orange front door can work well in any location. 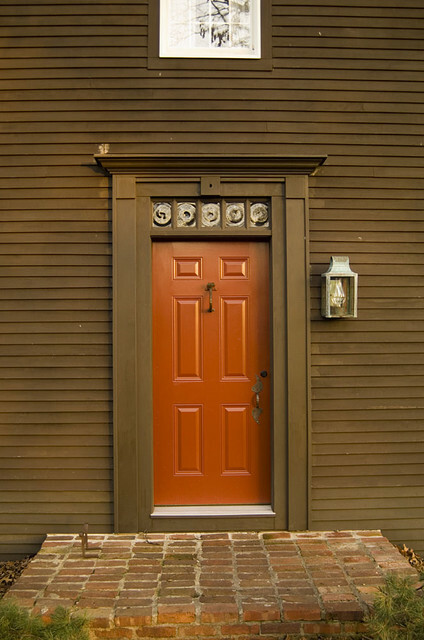 "Try painting an orange front door when you were originally contemplating red," says Kling. This is what we DONT want. The door looks cheap and hollow.